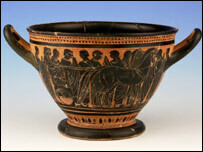 A museum of Greek archaeology was relaunched on Wednesday after a year-long revamp. The Ure Museum of Greek Archaeology at the University of Reading boasts the fourth largest collection of Greek ceramics in Britain. The makeover saw its displays spruced up for the first time since the 1970s. Its relaunch is being marked with a temporary display of a statue of Aphrodite and Eros on loan from the British Museum.